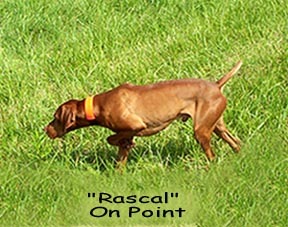 Welcome to the home of "Rascal"
#2 Vizsla Open Limited Gun Dog 2000 Vizsla Club of America. #3 Vizsla Open Limited Gun Dog 1999 VCA. Located just north of Asheville, in the beautiful Great Smoky Mountains of Western North Carolina is Midan Vizslas. Home of Breed and Field Champion Vizslas. Please take a few minutes to view our site. If you have any comments or questions, please don't hesitate to contact us. Thank you for visiting Midan. Rascal doing what he loves most!